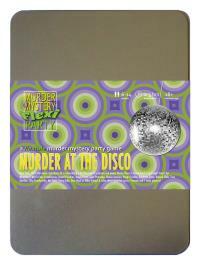 You've been invited to play the role of MIKE OXBIG in Murder at the Disco. New York, 1977. Hot nightclub Disco 54 is hosting a birthday and only the coolest people are there. But before anyone can 'get down on it', nightclub owner Doctor Disco is found dead in the VIP lounge! Join us to find out whodunit! When you’re not walking around in just your Y-fronts, you’re super laid back in flared jeans and a velour tracksuit jacket that can be ripped off for action at any moment. Is that a roll of socks in your pocket or...? As the only son of a priest you had a pretty normal upbringing. Prayer, confession, reflection, forgiveness - then tea and bed. After leaving school for college you found girls for the first time and decided religion would have to wait. Young, naïve and with the right tools for the trade, you were soon picked up by the B movie industry where you changed your name from Mike Ippers to Mike Oxbig, and you haven’t looked back since - not unless you’re directed to. I’m Mike, Mike Oxbig. You may have seen me in seminal classics like “Spitroast 7: The Beginning” and “Get On Up” with James Pound. Some people call them B movies, I call them videos because you can’t see them in the cinema. It’s a little known fact that Doctor Disco liked to make his own B movies and regularly shot my part in the VIP lounge. We did a scene in there tonight actually. Wait a minute… did someone say he’d been strangled with a scarf? Déjà vu time!